Notepad++ search functionality is great and very superior to most IDEs I am using. I would find it extremely useful to be able to exclude commented text while searching in my programming source code for a given text. This issue has been mentioned by other people in the web regrading Visual Studio et altri. However I believe that is has not been implemented so far. Please comment if it is there already and I have missed it. This is//A comment, with a comment symbol // !! As expected, all the words, containing a letter O or o, and which are outside comment areas, are changed upper-case !! It’s important to note the order of the search : First, the comment areas, secondly, if not, the interesting text to search for ! IF group 1 does NOT exist, the part after the semicolon : is executed. Then, as $0 stands for the complete match, any comment area, which is outside group 1, is just re-written ! 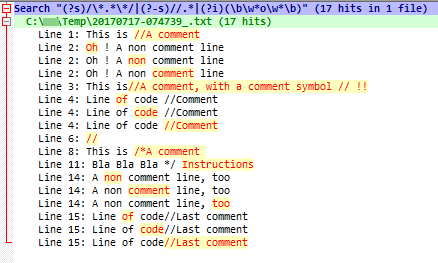 When I first thought about it, my regex tried to catch NON-comment text, only ! But, despite I succeeded to build correct regexes, I met some particular cases ( for instance, a comment area, containing other comment symbols ! ) which did not work properly ! Hi Guy. The original poster was asking about searching, but your reply discusses replacing. I tried some things with your search regexes without the replacement part, but got results that weren’t in line with what the OP wanted (for instance, I got hits like shown below, where clearly the hit text is sometimes INSIDE the comments). I must be missing the key point here; can you help clarify my misunderstanding? Of course, my previous regex works, only if the conditional replacement is present and if you perform a replace operation ! Indeed ! If you just want to search, for text, in particular zones ( Inside NO-comments zones, in our case ), the logic, exposed in my previous post, cannot be used !